This expedition has an amazing task in front of it as it will try to tackle scientific questions about both the tectonic and climate history of Zealandia as well as try to connect how tectonic changes affected global climate in the past. To fully understand the recent past, it may be nice to first look back at the history of Zealandia through geologic history. Zealandia has a long geologic history, as it was once part of Australia, which was part of the super continent called Gondwana, an ancient super continent that existed for hundreds of millions of years. It originally formed from the melding of smaller continents and micro continents during the Pre Cambrian (> 543 million years ago). Figure 1. The Gondwana supercontinent showing the microplate assemblage of this super continent. From Meert and Lieberman (2008). During this time this super continent wandered near the south pole between 600 and 200 million years before breaking about around 170 million years ago. Figure 2. Evidence for continental drift. 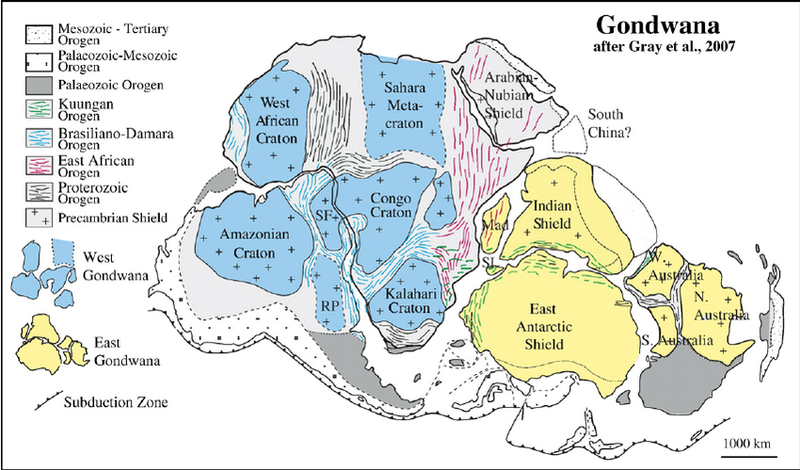 Gondwanda and today’s continents and the direction they went starting about 170 million years ago. What is interesting is that the geologic research of the break up of Gondwana was the primary evidence in developing the idea of continental drift developed by Wegener in the early 20th century, which later became the theory of plate tectonics during the 1950’s and 1960’s. He hypothesized an ancient land mass called Pangaea, with the northern half of Pangaea called Laurasia, the southern half Gondwanaland. He presented multiple lines of evidence clearing showing that Gondwana existed up to the Permian and early Triassic (300-200 million years ago) and that it broke up in stages. Figure 3. Evidence for continental drift. 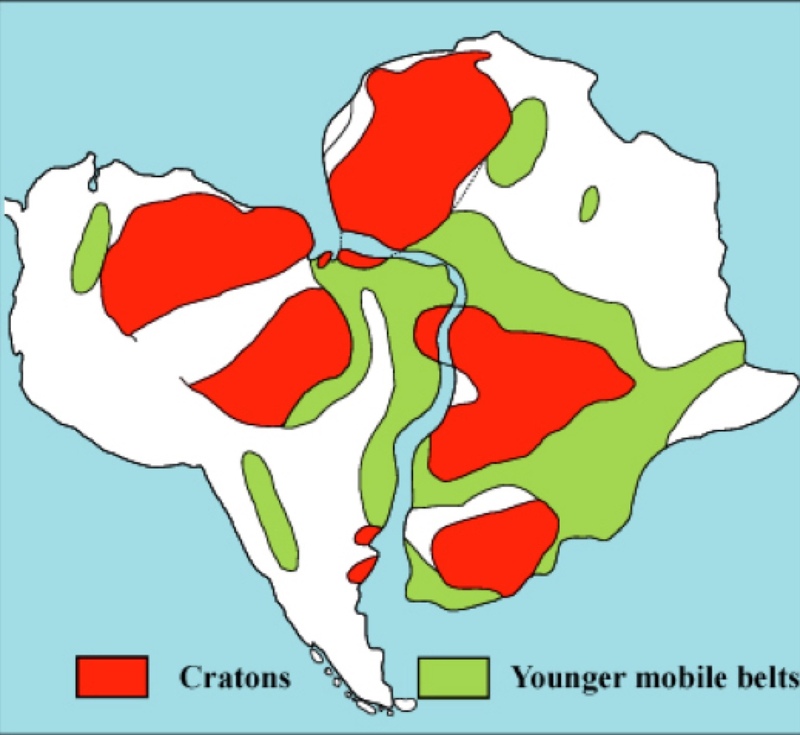 Cratons (stable continental crust) and mobile belts (ancient mountain ranges) and how they match perfectly between South America and Africa. Figure 4. Evidence for continental drift. 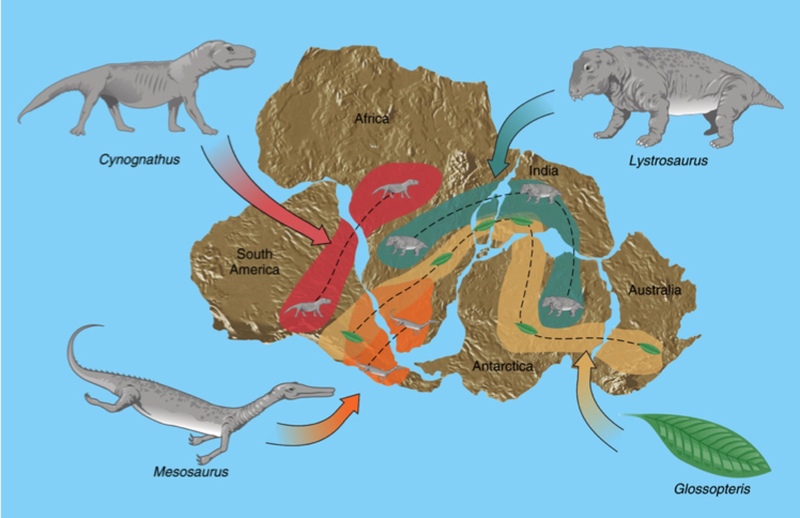 The patterns in fossil species locations only makes sense if the continents were once connected. Figure 5. Evidence for continental drift. The upper figure shows glacial deposit locations from an ice age that occurred 300 million years ago. 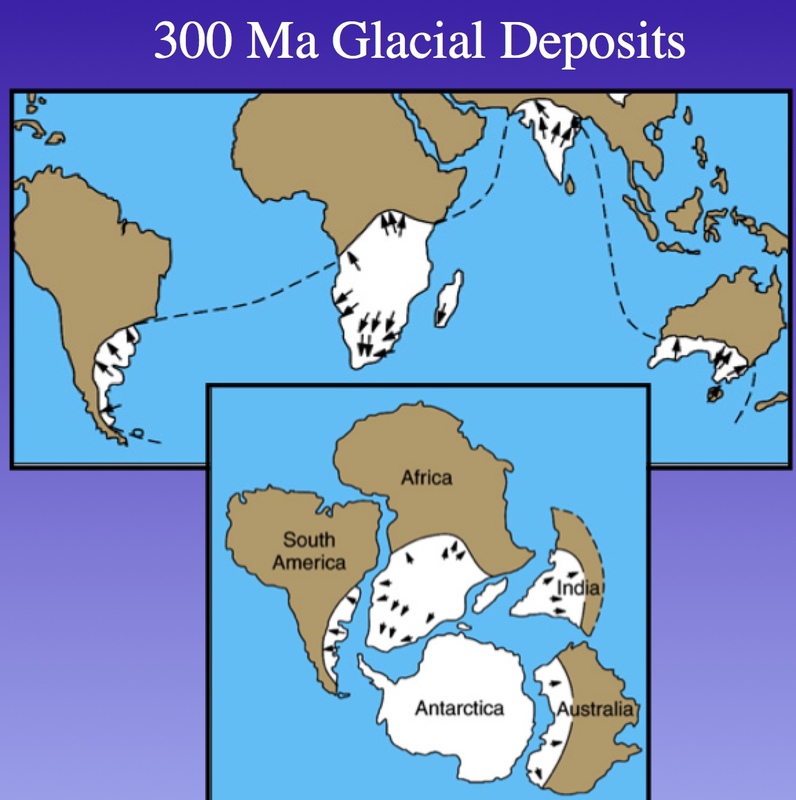 The lower figure shows the continents reassembled into Gondwana, presenting convincing evidence that they were all once joined and located near the South Pole. The east coast of Australia (which was Zealandia between at least 350 million years ago until about 100 million years ago) experienced tectonic convergence, in other words another plate was colliding with it. For my geologic readers, the eastern margin of Zealandia experienced subduction, with oceanic crust subducting below it. 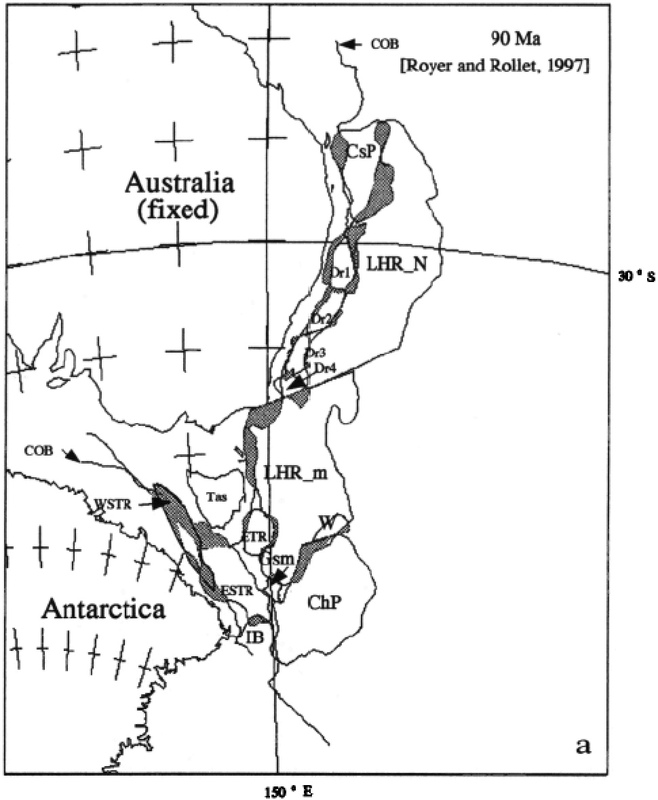 For some reason around 100 million years ago, tensile (i.e., pulling away) forces began to act on it, resulting in first a rift zone that began separating Australia from Zealandia. Finally around 80 million years ago, a new sea began forming between the two continents. Figure 6. 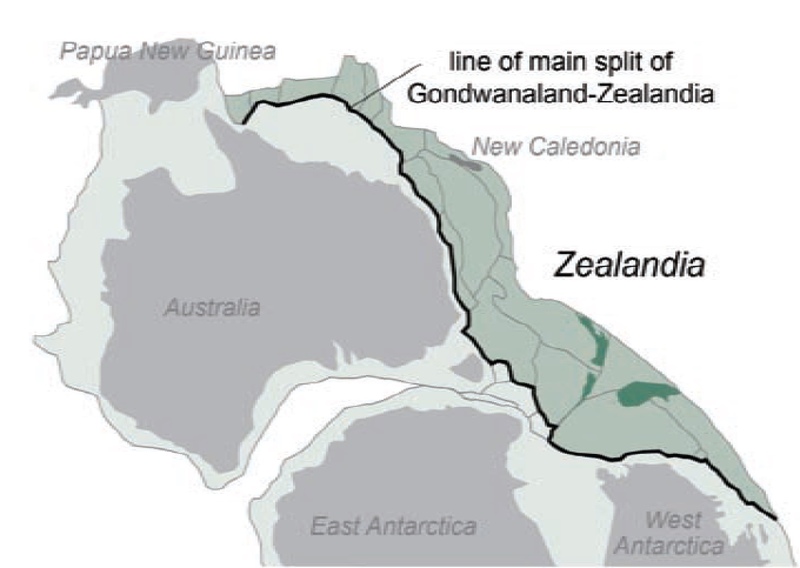 Figure showing the rifting zone between Zealandia and Gondwanaland (from Campbell et al., 2012). Figure 7. When Zealandia and Gondwana rifted, the fracturing resulting in about 13 separate plates, some the size of large islands. Many of them sank below the waves. Some stayed with Australia, some stayed with Zealandia. Plate labels are AUS, Australia; TAS, Tasmania; LHR, Lord Howe Rise; DR, Dampier Ridge; STR, South Tasman Rise; GSM, Gilbert SeamounCt omplex; NZ, New Zealand;C hestP. 1, ChesterfieldP lateau;C hall. P1, Challenger Plateau; Bellona Tr, Bellona Trough; Lord Howe, Lord Howe basin; Middleton, Middleton basin; ETR, East Tasman Plateau; Marion P1, Marion Plateau. From Gaina et al. (1998). Spreading continued from ~80 to ~50 million years ago creating the Tasman Sea. At ~50 million years spreading ceased and compression commenced. The result was that parts of Zealandia was squeezed and were uplifted. At some point, a new subduction zone was initiated east of Zealandia, which relaxed the compression resulting in subsidence (sinking) of the continent to its current water depths. However, the devil is in the mechanisms for this compression and then relaxation. 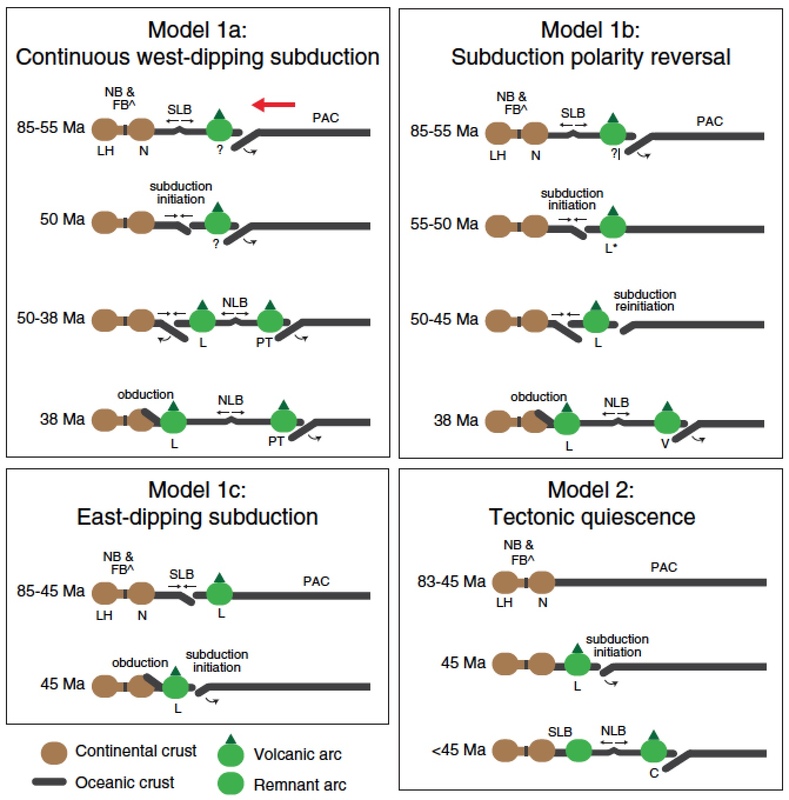 For example there are at least four contrasting tectonic reconstructions proposed for the Late Cretaceous to mid Eocene (~85–45 million years ago) evolution of the southwest Pacific (see figure 8 below). This is mainly due to a paucity and ambiguous data. This has led to uncertainty in the timing of and motion at plate boundaries in the region. It seems incredible that 50 years after the plate tectonics was “proven”, that such basic uncertainties and questions still exist anywhere in the world about an area’s tectonic history. Because of these unanswered questions, one of the main goals of the IODP Expedition 371 is to constrain the timing and magnitude of the uplift and subsidence at five different locations on Zealandia. This is expected to provide the means to determine which model best explains the plate motions of this area or to develop a completely new tectonic model for this area. Figure 8. Here are four proposed tectonic models for the southwest Pacific since the mid Cretaceous, based on previously published reconstructions (from Matthews et al, 2015). While the details of each model is not important, I just wanted to show the complexities in understanding the geology and tectonic history of this area. For those interested what the initials mean: NCB, New Caledonia Basin; SLB, South Loyalty Basin; PAC Pacific Ocean plate; FB, Fairway Basin; NLB, North Loyalty Basin. In my next blog, I will talk about how Expedition 371 will be developing high-resolution paleo-climate and oceanic records for Zealandia. Stephen Pekar, a geology professor at Queens College, has been investigating past climate and oceanographic changes during times (16- 45 million years ago) when CO2 was as high as what is predicted for this century (500-1000 ppm). As CO2 is rising rapidly today, which is predicted to be like putting our climate on a “hot plate”, exploring these times for him is like “Looking Back to Our Future”. To investigate climate change of the past, he looks at sediments, microfossil, and geochemical data obtained from cores obtained from near-shore to deep-sea locations ranging from the tropics to Antarctica. His research has taken him on expeditions around the world, including four to Antarctica, one of which he was project leader. Professor Pekar is a Queens native, growing up in the Rockaways and attending Queens College, first as a 20th century music composition major, but ended up studying Geology and getting his PhD at Rutgers University and doing a Post Doctoral Research at Columbia University. He is enthralled and in love with exploring and discovering new places, cultures, and ideas. He has traveled to all seven continents (soon to be eight!) and has explored over 50 countries, working in six of them ranging from archeology in France, grape picking in Germany, movie extra in China, to house pianist in a restaurant in Israel. His favorite place has been Antarctica, as it is the most remote place on Earth and for him going there to conduct research is like going to another planet and exploring undiscovered country.